Thank you for making 6 Degrees Berlin such a success! Hundreds of people from dozens of countries engaged in a full day of conversation and action on immigration, refugees, belonging, and how we build inclusive societies, featuring Josef Haslinger, Ai Weiwei, Naika Foroutan, and more than 20 speakers (see list below). We live in an era of unprecedented movement and displacement of peoples around the world, some of them immigrating to other countries, some of them fleeing for political reasons or reasons of economic despair. The result is the growth of complex allegiances to place and identity. We need to have a new kind of conversation about how society will deal with fundamental questions of belonging, inclusion, and social resilience. We need to distinguish between integration and inclusion. We need to find new forms of social and civic engagement that can help people to live and work together. Welcome to 6 Degrees Berlin. 6 Degrees drives a global conversation on citizenship and inclusion. 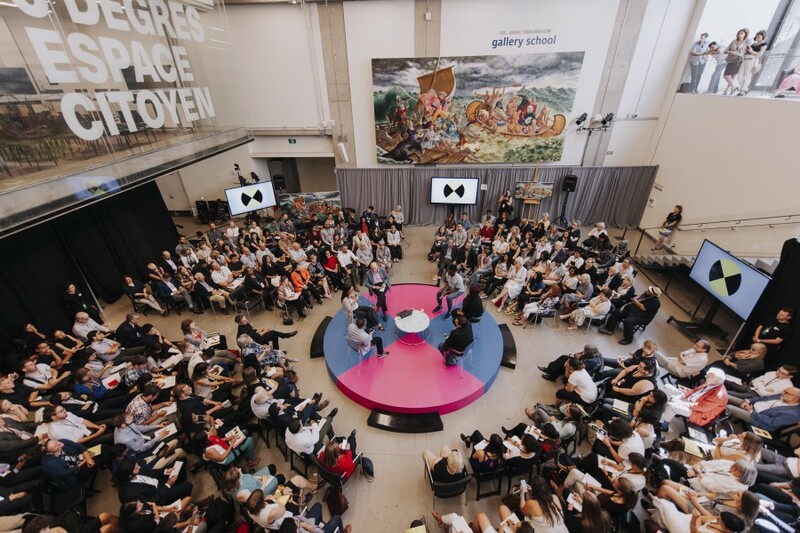 The Canadian initiative includes an immersive annual three-day event in Toronto, as well as a series of one-day pop-ups across Canada and around the world. 6 Degrees is about connection, conversation, artistic representation, and the power that comes from bringing people together. It is about what we can do to counter rising nativism and exclusion, and how we can go about doing it. It is also about language: how better language can make for better thinking; how we can reframe issues to open hearts and change minds. 6 Degrees is presented by the Institute for Canadian Citizenship. 6 Degrees is anchored by our signature 360s. Closer to lively conversations at a kitchen table, these in-the-round 90-minute experiences seek to dissolve the distinction between on-stage speakers and off-stage audience. At the heart of every 360 is a compelling idea—a concern and challenge—one requiring that we talk it through together and see what we can come up with. You are part of this. Everyone in the space is encouraged to expand the conversation; only then can the circle truly be widened. We live in a time of change. Climate, technology, and mass movements of people are an everyday reality, resulting in a more complex relationship to each other, and more complex allegiances to place and identity. Established institutions and frameworks are struggling to accommodate this complexity. Public debate is increasingly emotional, social trust is in question. Some institutions are under serious threat of breaking. As societies confront these challenges, we are facing resurgent xenophobia, populism, and divisive pressures. Unilateralism is on the rise. How do we confront these challenges? How can we move past our current deficient models of integration towards true inclusion? We need to deal with the rising forces of division. We need new approaches to fundamental questions of belonging, inclusion, and social resilience. Using the wrong language distorts thought, and leads to bad policy. To combat these forces of division, we must work to create better language, inspire better thinking, and drive better policy. We need new forms of social and civic engagement to help people to live and work together. How do we foster belonging? What models are working globally? Art, in its many forms, serves more than mere aesthetics. It represents identity and community, dreams and ideals, activism and protest. It captures the spirit and struggles of a time and place, and the fight for freedom of expression, common ground, and human rights. This session will look at how artists have been at the cutting edge of social change throughout history, reflecting the times they live in by dealing with urgent issues while creating and challenging ideas of beauty and perfection. Change your language, change your thinking. For centuries, coffeehouses have been meeting spots for lively debates about current events, politics, art, and culture. By interrogating the language we use around immigration, inclusion, and diversity, we look to change minds and policies alike. Have your say in defining the terms that matter, and informing the conversations of the day. For our final 360, we bring forward key conversations and outcomes from the day of conversations at 6 Degrees. Calling on any and all in attendance, we open the circle: everyone is a participant, all voices are equal. Together, we frame what we’ve discovered as a group, and decide what the next steps should be. 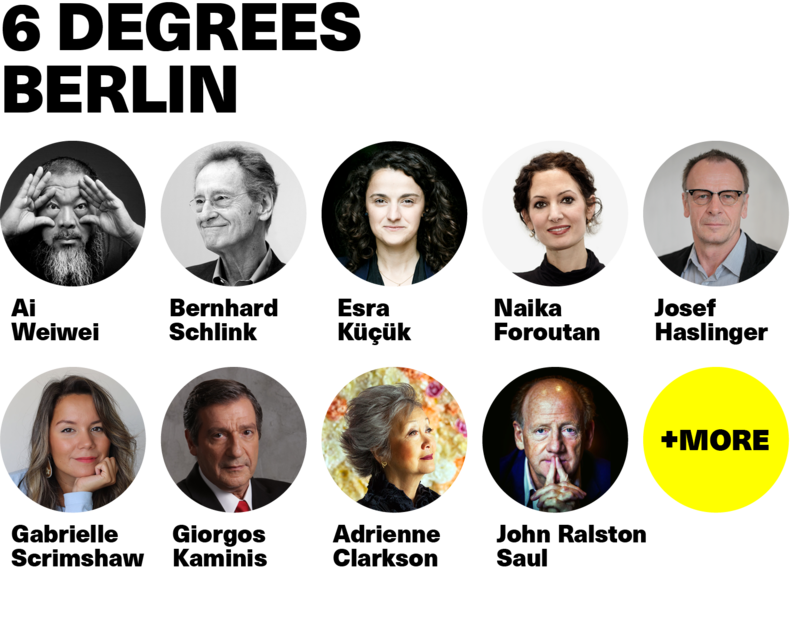 Click here to see the full bios of 6 Degrees Berlin speakers.